Pogba scores the first Premier league goal of 2018/2019 while Shaw scores his first senior goal of his career as Manchester United beats Leicester City. France midfielder Pogba stepped up and after a slow run up placed the ball in the top right corner above Kasper Schmeichel and is a goal what a great penalty kick, The World Cup winner had not even expected to start, having only returned to training on Monday. Luke Shaw then scored the first senior goal of his career after controlling Juan Mata's pass to double their lead at the 83rd minuted. Jamie Vardy of Leicester scored a late goal at 90+3 minutes after Ricardo Perreira's cross had hit a post, and Foxes goalkeeper Schmeichel came forward for an injury time corner but his header went wide. “For me it’s the first one, it doesn’t matter how I score it. I meant to come inside but I managed to get my foot on it and put it into the corner. Schmeichel said to me afterwards ‘You spawny man’ but I don’t care. It’s the best feeling of my career so far. I’ve worked really hard over pre-season; fitness-wise I felt really good. I know I can still be better and I want to be a better player than today. “We started ok, I wouldn’t say it was the best game, but it’s normal, we just started to play together, I can feel he’s a very good player and will really help us. I feel very comfortable with him and with the rest of the centre mids. We will be very happy with Fred this season. 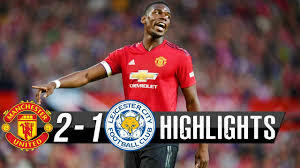 It was a great opening game for the reds, Manchester United will meet Brighton for their next match on Sunday 19th of August 2018.